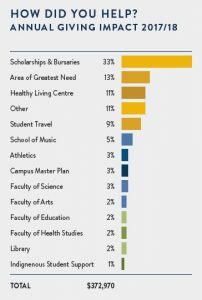 Brandon University’s 50th anniversary year sparked an extraordinary outpouring of generosity from donors, who responded to BU’s Annual Fund appeal by more than tripling last year’s amount. More than $370,000 was received between Oct. 12, 2017 and Oct. 12, 2018 — a timeline that ran from Homecoming to Homecoming as Brandon University celebrated its BU50 anniversary. Multiple donors were inspired by the anniversary celebrations, including an anonymous gift of $50,000, a total of $50,000 from members of BU’s President’s Advisory Committee, and a $50,000 donation to the HLC from BU Board of Governors member Kerry Auriat. 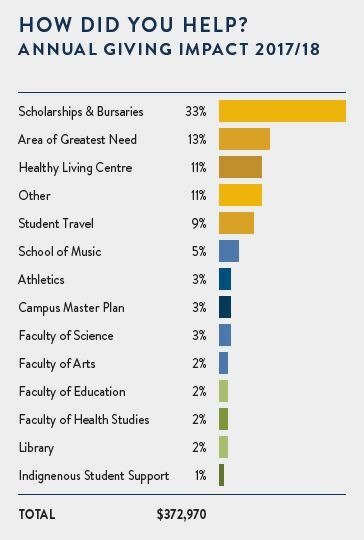 The impact of donors in to the Annual Fund. The anniversary appeal also prompted more than 40 people to donate for the first time, together contributing more than $11,000. Brandon University hopes to keep this momentum going. Their direct mail appeal for 2018–19 was launched in October and more than $55,000 has been received already. Areas being highlighted this year include student travel opportunities, scholarships and bursaries, and the ongoing needs of faculties, schools, and facilities. Donors can always choose to designate their gift to an area of interest to them. Donating to the Brandon University Foundation is easy. You can give online at BrandonU.ca/Give, call 204-727-7374 or visit the Office of Advancement and External Relations in Clark Hall. Cheques can also be mailed to the BU Foundation at 270–18th Street in Brandon, MB. Donations to the BU Foundation can also be arranged through BU payroll deduction. Donations received or postmarked before the end of the year are eligible for a 2018 tax receipt.